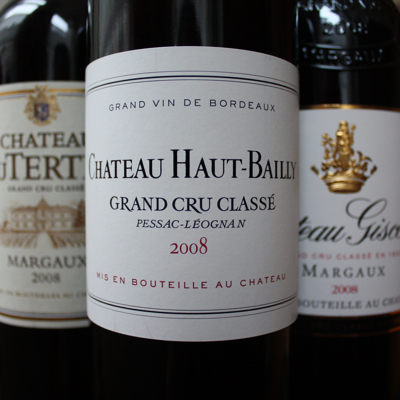 The Bordeaux 2008 vintage is about to loom up on the horizon. The wines have all been bottled, and the bottles are resting quietly at the châteaux - read: stabilizing and maturing - before they will leave Bordeaux in the course of 2011. However, some bottles left earlier. They were opened at one of the Union des Grands Crus tastings that are traveling around the world. Yesterday the royal procession halted in Brussels. The result: this posting cannot be complete. But luckily there are plenty of accounts of these UGC 2008 tastings, e.g. you might check out Neal Martin's stories on the 2008s (login required). Let's start with a general impression. The picture is good but varies. I have tasted plenty of wines that did not convince me (these I have not listed in this posting). A few were easy and light, OK for the short term but not especially exciting. Some wines were dull without fruit, or without a so-called mid-palate - empty wines. A few were over-extracted and/or were showing unpleasant, unripe tannins. But luckily these failures belong to a minority. Most of the wines range from correct to good, and even to great. Note: interesting wines such as Fonroque and Grand-Corbin-Despagne were not present. By the way, this posting would have been incomplete anyhow: there were no premier grands crus to taste… The conclusion: Bordeaux 2008 is a true value for money vintage. Good quality, and 'cheap' compared to 2009. The 2008 prices are gradually increasing now, but there are still some very interesting deals to make. No opinion on Pichon-Baron? It was my favorite of the UGC tasting in Los Angeles.